13908 8th Battalion Suffolk Regiment. Frederick Carter, known as Fred was born in Great Cornard around 1890. He was the son of Charles and Maria Carter. He was one of 6 children and the family lived at 2 Cats Lane, Great Cornard. His father was employed as a farm labourer, his mother as a laundress. His mother used to collect the washing from wealthier families in a pram and do the laundry in a shed behind the house. Fred enlisted in Sudbury and served with the Suffolk Regiment, in the same battalion as Arthur Bruce and Fred Carter. He is recorded as having first served in a’ theatre of war’ in France on 25th July 1915. On 15th November 1916 a report in the Suffolk and Essex Free Press listed Fred as ‘missing’. The 8th Battalion was a volunteer battalion. In June 1916 it was moved to Carnoy, in the Somme sector to act as reserve in the forthcoming attack on the 1st July. On 19th July the battalion sustained heavy casualties in an unsuccessful attack at Delville Wood (known by the soldiers as Devil Wood) at Longueval. By September the battalion was in action at Thiepval and was successful in capturing all 3 of its objectives. The First Battle of the Somme was a series of 12 battles over 141 days from 1st July 1916 to 18th November 1916. Frederick was officially reported as killed in action aged 36 on 28th September 1916. There is no known grave and he is remembered on the Thiepval Memorial, Somme, France. 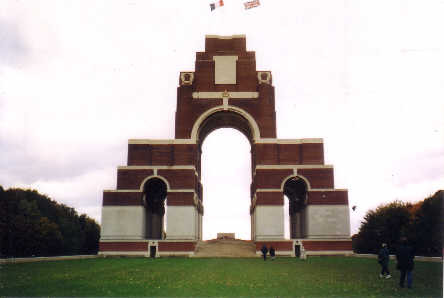 The Thiepval Memorial bears the names of 72,089 casualties who lost their lives in the Somme sector and who have no known grave. Fred’s medals and death plaque are on display in The Suffolk Regiment Museum in Bury St. Edmunds. He was awarded the 1914-15 Star, the British War Medal and Victory Medal. Fred never married so after the war his mother was entitled to his war pension. His great niece recalled having to go with her great grandmother to help her when it was icy to collect it at the Sudbury Post Office, which at that time was in Station Road.